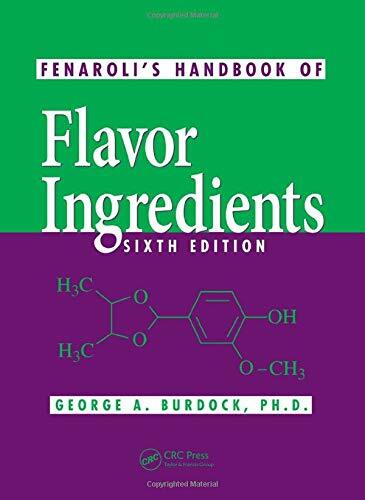 Since publication of the first edition in 1971, Fenaroli’s Handbook of Flavor Ingredients has remained the standard reference for flavor ingredients throughout the world. Each subsequent edition has listed more flavor ingredients and allied substances, including those conferred food additive status, substances generally recognized as safe (GRAS) by qualified scientists (including the Flavor and Extract Manufacturers’ Association Expert Panel) and those substances having undergone GRAS Notification with the Food and Drug Administration (FDA). The fourth and fifth editions added more than 300 new entries and represented a total reorganization and updating of the text, consistent with new data and regulations. This, the sixth edition, is likewise expanded with over 200 new entries, including many botanicals and other natural substances. The addition of botanicals is a response to an expanded readership with an interest in dietary supplements, in which a number of flavoring botanicals serve a dual role. Features over 200 entries, including many botanicals and other natural substances.